Recently, something of a brouhaha developed over the rating of tornado intensity on the so-called EF-Scale. But there have been some important new developments. 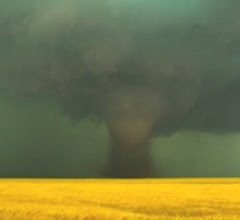 The massive, deadly tornado on 31 May 2013 in Oklahoma initially was rated an EF-5 tornado by the Norman office of the National Weather Service (NWS), largely owing to mobile Doppler radar data, because the tornado stayed mostly in open country, with a dearth of damage indicators. The revised F-Scale, now known as the 'enhanced' F-Scale (or EF-scale) has become entirely focused on damage indicators, so the EF-Scale has become virtually completely a damage scale, not an intensity (windspeed) scale. This is, in part, the doing of the structural engineers, who believed the upper end windspeeds on the EF-scale were too high - they succeeding in a downward revision of the windspeeds associated with structural damage on the revised rating scale: e.g., EF-5 now begins at a lower bound of 200 mph, whereas the F-5 threshold was 261 mph. There are some reasons to believe this is something of a problem - i.e., rating almost exclusively on damage (with the damage indicators biased in favor of US construction practices). In an argument evidently based mostly on the notion of consistency, NWS management is basically saying mobile Doppler data should not be used to make tornado intensity ratings. This is the ruling that dictated downgrading the rating of the El Reno tornado from EF-5 to EF-3, as well as some others. The 'consistency' argument is, in my opinion, not very compelling. This argument is unfortunately all too common within the NWS as a reaction to technological innovation. I could provide numerous examples of the wrong-headedness of this policy, but I'll try to keep this as concise as possible. Resistance to new technology, and trying to force 'consistency' with older technology is just wrong. Should we degrade the data obtained by WSR-88D radars to that from WSR-57s simply to maintain consistency with the older data sets? Should we disregard the dual polarity information of the new upgrades to the WSR-88D radars just to maintain consistency with the old versions of the radar? When something new and exciting comes on line, its capabilities should be embraced by the agency, not rejected as inconsistent with older technology!" Moreover, all the bureaucratic concern about the 'consistency' of the EF-Scale ratings strikes me as rather silly. The existing record is laced with numerous inconsistencies for a host of reasons - too numerous to mention in detail. Denying the value of the most direct and objective measurements of wind speed in tornadoes (apart from the extremely infrequent occasions when an anemometer record survives) in order to maintain consistency with an inconsistent data set strikes me as silly. You can argue we shouldn't introduce yet another source of inconsistency, but I say we should take advantage of new technology as soon as possible and not get trapped into this foot-dragging argument. Actually, the Doppler data are a source that can reduce inconsistency! I agree we need to develop a consensus on how to use the new data, but that shouldn't be an excuse to ignore the data until that consensus emerges. At the very least, the rating of the El Reno tornado should be EF-3+, with the + sign indicating it's a lower bound based on the limited damage indicators, so the actual rating might well be higher. The NWS bureaucracy can, of course, make up any rules they wish to impose on the process. Their subordinates do the actual work when it comes to the 'official' record in Storm Data, and those people are subject to the dictates of their organizational managers. However, here's the rub - much is made of the records in Storm Data, and those data form a critical part of many scientific investigations. This is true of a lot of the data collected by the NWS - it's collected largely to serve immediate operational needs, but is the basis for a lot of scientific research, as well. Any decisions by the agency about data collection have impacts on science. The NWS is an agency almost totally focused on the operational application of science, not scientific research. Although some forecasters are by their own choice, involved directly in research, their agency is not very much interested in it and offers them little or no support. NWS decisions about Storm Data affect the science, but those decisions aren't necessarily made in the interest of science! Dr. after reading another blog of yours on this subject I was left with the impression that windspeed in the lower 10 meters of the funnel could be either higher or lower than what is measured 500 or so feet up. I am under the possibly incorrect impression that in order to assign an EF rating we want to know the windspeed in the lower 10 meters because that's where the damage is done. I am in favor of using the most accurate methods of determining windspeed that are available. Can you give us an idea of how useful doppler radar or lidar is in determining an EF rating? Thank you for your time and for making your expertise available. Am I detecting a hint of condescending sarcasm in your comments? Anyway, in my opinion, science has yet to establish a consensus on how to define tornado intensity. Your impression regarding winds in the lowest 10 m is not incorrect, but is not a comprehensive or complete understanding. 10 m is standard anemometer height and the putative wind speed of interest in tornadoes is the 3-second average at that height. Why 3 seconds? Is there something magic about either 10 m or 3 s? The engineers favor this definition for reasons of their own, but I find it rather arbitrary and without much logic behind it when applied to the winds in tornadoes. It's fine for siting a 'standard' anemometer, but that's not the point here. You may be unaware of some findings from the Spencer, SD tornado of 1998, in which Doppler-measured windspeeds were compared to the F-scale (not EF-scale) ratings at the surface - generally, the comparison generally indicated the Doppler winds were accurate in estimating the damage as rated on the F-scale. Much more of this sort of work needs to be done to establish the relationship between winds as measured by mobile Dopplers and the winds near the surface, but ... in the meantime ... does it make sense to ignore these actual wind speed measurements completely and rely instead entirely on the highly complex relationship between damage and wind speed? Thank you Dr. I did not intend any sarcasm although after re-reading my post I understand why you asked. I was not aware of the findings in the Spencer SD tornado. Thank you for bringing them to my attention. In order to answer your question I would need to ask the experts to what degree of confidence they can determine the wind speed near the bottom of the funnel using doppler radar measurements of windspeeds at say 500'. If they tell me that they have no idea at all of the relationship between the two, then I would have to say that the doppler data should be ignored, but not thrown out, and that unfortunately we'd have to rely on the damage indicators for the purpose of determining an EF scale rating. If they tell me with a high degree of confidence that the winds near the bottom can be computed using data measured high up in the funnel then I would rely mostly on the radar data and use the damage indicators as a double check. Radar or Lidar is most likely going to be the tool of the future for determining EF ratings, where it's available. The challenges as I see them are to get the Lidar or Radar to measure windspeeds as low as possible and to do more research to determine how winds change throughout the funnel. I agree with what you say in your essay about not discounting radar data for consistency reasons. However, there may be grounds for discounting it due to a lack of relevance. If it can't be used to determine windspeeds near the bottom of the funnel then it may be irrelevant for purposes of determining an EF rating. However, I doubt that will be the case. One thing that I don't understand is why DOW's don't seem to be able to measure down to say 100 feet. It appears that they frequently get close enough to a tornado to be able to shine a spotlight or aim a laser at the 100 foot level of the funnel. Sometimes they are probably close enough or elevated enough to see right down to the ground at the base of the funnel. I suppose that's a question for Dr. Wurman. From my second hand understanding the width of the El Reno 2013 tornado would have been even larger had the width been assessed solely on damage, but the width was revised downward when considering radar measurements. Is width an 'officially' recorded value for tornadoes, and if so should the width revised upward to remain consistent? A width estimate is a requirement for every tornado report in Storm Data. In my opinion, width estimation has been a nightmare of inconsistency. Just what is the width being measured? How do you separate RFD wind damage on the one side of the tornado from that damage done by the tornado? The requirements for the width estimate have changed over time. Even with radar velocity data, it's a mess!! What criteria do you use to define the 'edge' of the tornado? I know for sure it's not the width of the condensation funnel! Thoughts on: MLK and "I have a dream ..."